Buy Meridian Organic Dark Tahini 270g in the UK from our online shop or directly from our independent Scottish store. Meridian organic dark tahini is made using sesame seeds which are roasted and then ground into a creamy paste. Dark tahini is made from unhulled sesame seeds. Dark tahini is made using roasted and unhulled sesame seeds (different from light tahini, where the seeds are hulled). Fun to make with children. Enjoyable to eat! This recipe contains 1 tbsp dark tahini. Hummus or houmous is made with chickpeas and tahini. It is a very healthy side dish which can be served with seasonal vegetables and bread of all sorts. This recipe contains 3 heaped tbsp dark tahini. Where can you buy real Tahini Dark - Organic safely online? If you are wondering where you can buy Meridian Organic Dark Tahini 270g safely online in the UK, then shop with us. 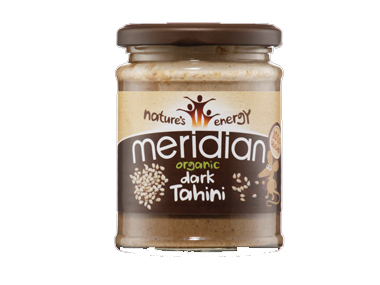 Tahini Dark - Organic - Meridian Organic Dark Tahini 270g in Nut & Seed Butters and Foods.